Enjoy a fun and educational 1 day sightseeing tour in the historical city of MALACCA for only $55 per pax! • 0630hrs: Assemble at Newton Hawker Centre Carpark and depart for Malaysia via 2nd Link (includes toilet stops and breakfast at own expense). Arrive at Honey Bee Farm for tour. Lunch at a traditional Baba Nyonya restaurant. Visit Baba Nyonya Museum, Jonker Street, Christchurch & A'Famosa. Enjoy local product shopping during free & easy time. • 1700hrs: Depart from Malacca and enjoy a seafood dinner at a local restaurant. Depart for Singapore after dinner. 1 voucher is valid for 1 pax. Minimum group size of 40 pax required to proceed. Malacca is a fascinating city that is rich in culture as it is in its history. A blend of many cultures from all over the world can be seen in their architecture, traditions, music, and cuisine. Malacca is seen as one of Malaysia's premier tourist destinations and is also one of UNESCO's world heritage sites, with its unique heritage and a multitude of hawker/street fare to gorge on. 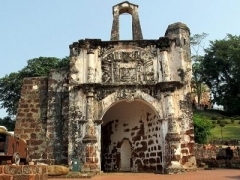 Today, one will find many remnants of Malacca’s glorious past dated back more than 500 years ago. On 7 July 2008, Malacca was officially listed as world heritage site by UNESCO. Trails of well preserved historical monuments and architecture of fallen colonies can still be vividly seen all within a stone's throw away from each other. Apart from the intricate historical landmarks, Malacca receives 7.4 million tourists each year from all over the world making it immensely rich in culture and truly cosmopolitan. No trip to Malacca is complete if you don't sample its flavourful cuisine, so don't forget to whet your appetite and gorge on some of Malacca's best-loved food favourites such as Durian Cendol, Baba & Nyonya fare, Satay Celup, Chicken Rice Ball, Nyonya Laksa, etc! • 0630hrs: Assemble at Newton Hawker Centre Carpark for departure to Malaysia. Depart via 2nd Link, includes stops for toilet breaks and for breakfast (at own expense), to be made en route. After that, arrive at Honey Bee Farm. At the bee farm, there would be a short commentary and tour about how the bees evolved from larva to become mother bees as well as how they produce honey. You can also taste sample of the different types of honey and make your own purchases. Followed by lunch at a traditional Baba Nyonya restaurant. After lunch, you will pay a visit to the Baba Nyonya Museum. At the museum, there would a guided tour through this traditional Baba Nyonya House. Learn about their unique customs and traditions as well as their living environment. End your trip with a Malacca City Tour that includes visits to Jonker Street, Christchurch and A'Famosa. To be followed by free and easy leisure time for local product shopping. • 1700hrs: Depart from Malacca. Enjoy a seafood dinner at a local restaurant. After dinner, depart for Singapore. • 2245hrs: Arrive back in Singapore.